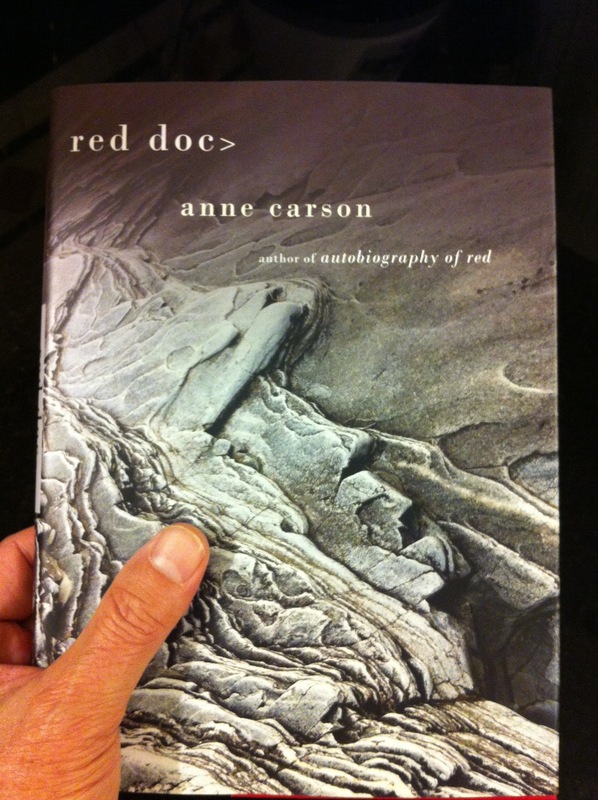 Re-reading Anne Carson’s translation ANTIGONICK and reading her novel red doc> in a single sitting has led me to want to blog here about both. I will be brief. I’m writing/posting via an iPhone as my only connection to the Internet. The former work mentioned is Carson’s rendering of Sphocles’s play. There are no page numbers and there are works of art, paintings by Bianca Stone, rendered on translucent pages that allow the capitalized handwritten words of Carson as the playwright’s to show through. 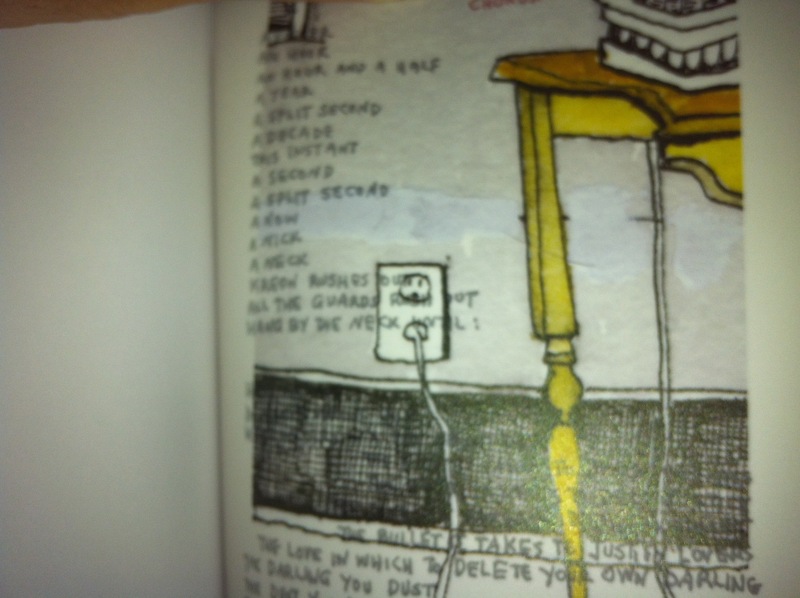 (The words only appear on the right-hand-side pages of the book.) It’s a work of art, and the wikipedia entry on the play shows scads of translations through the years, including all in English, to date, all but this one by Carson. I’m not sure all that says, but I do think that that’s telling. Carson knows ancient Greek better than any classicist or rhetorician or New Testament or Septuagint scholar that I know of. She plays on the English word, “nick.” Antigone, of course, is the titular protagonist of the play. 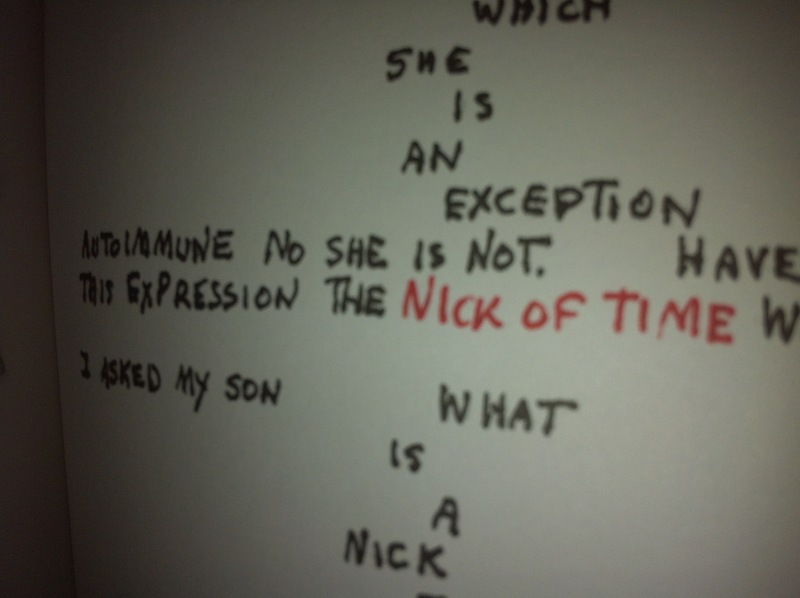 And Nick, she notes in her list of the cast, is “a mute part [always onstage, he measures things]” (her brackets). I mention this detail, as if it’s not obvious to all readers, simply because when you understand the play as a commentary on the lack of agency of females when it comes to the law and to rhetoric, then you get a hint of what Carson the translator means by her title for the work. Once upon a time, Greek men used the little suffix “-ike” or “-ic” to make very technic-al all the things they didn’t understand. Hence from logos came log-ic, from oikos and nomos came econom-ics, from the muse came mus-ic, and this allowed men disparging others to render the other mute. You can find Carson talking in an interview online about this work, but she will never give all of that away. How could she? You must read this book to hear it. The Autobiography of Red is a Greek novel Carson wrote in verse. And on the dust jacket of this new novel she writes in prose: “Some years ago I wrote a book about a boy named Geryon who was red and had wings and fell in love with Herakles. Recently I began to wonder what happened to them in later life. Red Doc> continues their adventures in a very different style and with changed names. // To live past the end or your myth is a perilous thing.” Style is the key to this novel. Carson writes it as a work of art, with color words. It’s another blank verse novel, and the verse is muscial, or connotes notes of music, with F and G and flat as proper nouns and adjectives. SAD and 4NO (as foreknowledge, as a prophet, as the biblical Isaiah even) and G and Red as names of people. It’s old and new. It’s personal and poetry complicating the differences between poetry and prose. On page 114, “Wife of Brain” (a recurring refrain through the pages) asks, “what is the difference between / poetry and prose you know the old analogies prose / is a house poetry a man in flames running / quite fast through it / or / ….” It really is, rather, a play. It’s a play on words with all sorts of Greek and Latin etymologies explicated, complicating. But red doc> really functions as a play. “… He is / rewriting his play as a / novel given the futility of / theater,” writes Anne Carson on page 147. We her readers might agree that Anne Carson has done it again. Funny, I was just considering a post on exactly these two books. Belatedly stopping by to say how much I appreciated this post. The play of word and image strikes me as very unusual: can one really call this a novel? I’d be interested in your take on these books too, Theophrastus. When I first read Antigonick, I thought to myself: this can only exist as a book — this work cannot be properly performed. In the same way, one could easily assert that Flatland, Alice in Wonderland, Ulysses, and Naked Lunch could never be made into movies. But I’ve now seen a stage version of Antigonick, and so now I think to myself: this can only exist as a book — this work cannot be properly performed. Victoria, Sorry to response so very late to your great question. Carson’s poetry (around Red) sure is a novel take on novel. Theophrastus, I think I would agree with you, and I’d like to see for myself too. At any rate, I’ve now written an anti-review of Carson’s translation of Sophocles’s play, which I still think is brilliant, bringing forward play that we don’t always get from the ho-hum usual theatric translations.